From the Marina to the Mission, from Dogpatch to the Outer Sunset, this city is in a ferment of creativity right now—culinary, artistic, and of course, technological. In fact, the flush times in the digital world are fueling a mini-boom of new brick-and-mortar restaurants and bars and shops. Aatxe. In this Basque-inspired outpost, chef Ryan Pollnow bows to the tapas canon, but standards like patatas bravas play a smaller part on his menu than cross-cultural riffs such as ramp and morel croquetas, and olive oil–poached radishes, salted with anchovies and tossed with bits of lamb belly and mint. Everything, from the seafood conservas to the meaty cazuelas, is built for sharing, and the bar is backed by some 60 varieties of gin. $$$; 2174 Market St.; . AL’s Place. Yes, AL’s Place sounds like a diner. But “AL” is Aaron London, who last cooked at Ubuntu, Napa’s erstwhile temple to vegetables, so the cooking is anything but short order. His mind-set remains veggie-centric, with a few of the meant-to-be-shared mains involving seafood. (The cured trout with potato chunks and green-fig mousse is a winner, especially for lox lovers.) Meat is relegated to the side dishes, and the hanger steak with sherry butter does complement an entrée of goat’s-milk curds and fennel over grits. Which is about as close to down-home as this food gets. $$; 1499 Valencia St.; . The Progress. With demand for provisions at their home base State Bird Provisions unrelenting, Stuart Brioza and Nicole Krasinski launched a new place next door. The Progress leans toward a dinner party format: family-style service, with your choice of six dishes. Modernist musings like matsutake mushroom dumplings, with sake leeks and kale, give way to mains such as lamb scaloppine with pea shoots and cipollini onions, followed by desserts of honey-cocoa ice cream, and jasmine tea–poached pears with plum jam and ricotta whey. Seats get snatched up swiftly in the two-story space, which operated as a theater in the early 1900s. A century later, it is part of the hottest twin billing in town. $$$$; 1525 Fillmore St.; . Rintaro. The menu here changes each night and usually takes some explanation. On one recent evening, the through-line was niboshi (tiny dried sardines). It was mixed with candied walnuts and chile powder as a bar snack, incorporated into a cloud of bonito shavings on top of flanlike tofu, and presented in an antique blue porcelain dish. The Mission District restaurant—all warm wood and comfy booths—is inspired by the izakaya tradition: charcoal grilled meat accompanied by lots of beer and sake and laughter. The atmosphere isn’t so much raucous after-work blowing-off-steam, though, as it is genteel, nice dinner-out. $$$$; 82 14th St.; . Cockscomb. Incanto vet Chris Cosentino, a chef known for celebrating unsung proteins, goes whole hog in his showy SoMa project, where the kitchen stuffs its meat pies with snails and pork belly, and a roasted pig head turns up fit for sharing at your table and on Instagram. Diners disinclined toward Game of Thrones–style feasting can find lighter fare in platters of raw shellfish and pickled sardines with lively giardiniera. But there’s no mistaking the aesthetic of a menu that features beef heart tartare and a little gem salad flecked with crispy pig skins. It’s tail-to-snout eating, riding high as an urban trend. $$; 564 Fourth St.; . Crystal Jade Jiang Nan. As extravagances go, nothing tops this 20,000-square-foot Embarcadero palace, the first North American offshoot of a Singapore-based restaurant conglomerate with outposts in 20-plus Asian cities. River-washed stone floors and chinoiserie wallpaper adorn a convention hall–size dining room, which gives way to hallways devoted to fish tanks, a Peking duck oven, coffee and tea service, and more. Beyond them spreads a patio with Ferry Building views. The build-out reportedly cost $14 million. But many of the dishes—mapo tofu, dim sum of all kinds—are tasty and affordable. $$; 4 Embarcadero Ctr.; . The Interval. Housed in the Fort Mason headquarters of the Long Now Foundation—the private nonprofit behind such quirky-yet-yet visionary projects as the 10,000 Year Clock—this cafe-bar may sound mildly out of place in theory, but it’s perfectly delightful in practice. (Thanks in large part to the involvement of noted bartender and booze historian Jennifer Colliau.) Look for the Midas Touch, from Dogfish Head Brewery, a spiced beer based on a 3,000-year-old recipe pulled from Midas’s tomb and, from a northern Italian winery called Pelissero, an award-winning Barbera-Nebbiolo blend named in honor of the foundation. $; 2 Marina Blvd.; . Smokestack. A soaring warehouse in the Dogpatch has been dressed up in the manner of a post-Depression bar, with distressed wooden floors and old newspapers pasted on the walls. The patrons work hard at being throwback, their Deadwood-era beards and retro denim establishing a look that verges on self-parody. The barbecue, however, is no joke. Dennis Lee, the chef and co-owner of Namu Gaji, oversees the smokers, producing a classic-modern mix that ranges from Thai sausage and crisp-skinned smoked duck to Wagyu beef brisket in a traditional Texas-style rub. Vinegar- and kimchi-spiked sauces shine, as do sides like housemade slaw and baked beans with burnt ends. It’s all served over the counter, on metal trays lined with butcher paper, just as in the olden days. $$$; 2505 Third St.; . Locanda. Delfina introduced the Mission to the best of Tuscany. For their second serious restaurant, Craig and Annie Stoll looked to Rome for inspiration. Locanda’s glossy interior carries a whiff of Marcello Mastroianni: geometric white tiles and ’60s-revival light fixtures. Get the pizza bianca with whatever the topping is, a plate of carbonara, and anything from the offal section of the menu. The wine list is filled with obscure, not-too-pricey Italian labels, and the bow tie-wearing bartenders mix maybe the best negroni in town. $$$; 557 Valencia St.; . Nico. Bill your restaurant as a “modern bistro,” and you give yourself permission to be a lot of things. At their Pacific Heights hot spot, French-born Nicolas Delaroque and his wife, Andrea, take advantage of that creative leeway with a menu that comes off as at once rustic and refined. A gathering of peas makes a showing in a bath of its own jus, with white peaches, fromage blanc, and nutty quinoa. Chile pepper cod, topped with frothy fish foam, takes on the earthy flavors of artichoke barigoule. In keeping with the cuisine, the dining room is elegant without feeling fussy, its blocky wooden tables left uncovered for cooking that is worthy of white cloths. $$$; 3228 Sacramento St.; . The Buchanan. Union Square may be close to the city’s Mid-Market buzz, but consider the perks of positioning yourself in a more Zen outpost like Japantown: no cable car gridlock, minimal tourists, and a short walk to neighborhood superstars like Kabuki Springs & Spa and Out the Door. Such is the case with The Buchanan, a sweetly understated 131-room inn that feels more like a quiet apartment than a hotel complex. The decor nods to its neighbors, with Japanese-print pillows set against a neutral backdrop and a Japanese whiskey-bottle sculpture dangling in the lobby. And instead of a bathrobe, guests get a sleek kimono. $$$; 1800 Sutter St.; . Hotel Zephyr. Don’t be surprised if you imagine a ship resting at port at Fisherman’s Wharf’s maritime-themed Zephyr, a former Radisson turned into a refreshingly modern boutique hotel with a sense of humor. Porthole windows look to Alcatraz and the Golden Gate Bridge, while Pacific blue walls and steel gray floors add to its vessel-like feel. The decor nods to nautical pop figures, rowdy sailors, and mermaid wall art, illuminated by exposed Edison bulb light fixtures in the lobby. In the back, an area called The Yard features a 10,000-square-foot hangout space with a firepit and games. $$$; 250 Beach St.; . Hotel G. In Union Square, where the chaos knob can feel like it’s stuck on 11, it’s sometimes difficult to find a restful place to … rest. The Hotel G has 151 surprisingly mellow rooms that seem more like a stylish apartment building than a downtown hotel, decked out with simple homey decor and brightened with Etsy accessories that transport you away from the urban hubbub. Art from Mission-based Creativity Explored hangs on the walls and the preserved turn-of-the-20th-century building reminds you of the neighborhood’s pre-H&M era. $$$; 386 Geary St.; . Once, only campers and soldiers could bed down in San Francisco’s Presidio. Now this century-old brick barracks offers 22 comfy rooms in the middle of the park, plus a stand-alone four-bedroom cottage called the Funston House. $$$. or 415/800-7356. Inn at the Presidio. It used to be that only campers and soldiers could bed down in the Presidio. Now the Inn at the Presidio, a century-old barracks, sets 22 comfy rooms in the middle of the park. The brick beauty has been restored with stone fireplaces and wide porches whose rocking chairs are perfect for peeping the Golden Gate Bridge. $$$; 42 Moraga Ave.; . Hotel Vitale. Nature-inspired rooms feature spectacular views, glassed-in limestone showers, and custom bedside tables with river stones underneath glass tops. Look high and low for two other favorite features: At street level, Americano restaurant and bar ($$$) showcases modern Italian cuisine; on the rooftop, a spa (from $60) offers free yoga for guests, plus outdoor tubs overlooking the bay, yet cleverly tucked away with plantings of bamboo for privacy. Breathe deeply, and relax. $$$$; 8 Mission St.; . The Strand Theater. San Francisco’s celebrated repertory theater company, the A.C.T., ushered in its second act in spring 2015 with the opening of its new playhouse, The Strand Theater. The building has been through many incarnations since it first opened as a silent-film theater in 1917, but most recently was shuttered for nearly a decade. A $34 million facelift helped revive some of its history, like restoring the building’s façades and moldings, while bringing it into the future, like the Mid-Market neighborhood it’s located in. The art installation in the lobby (a massive LED screen) feels particularly of the moment, given its techie neighbors. $$$; 1127 Market St.; . Presidio Officers’ Club. At the top of the Presidio’s Main Post—a tidy square, framed by brick barracks and site of the original Spanish garrison built in 1776—this 37,000-square-foot building acts as a combination visitor center, museum, and gathering place. Its Moraga Hall is a real sit-down-and-relax lobby, complete with fireplace, in the tradition of the grandest park lodges. The Heritage Gallery, though, reminds you that the Presidio wasn’t always a place for recreation, but the last stateside stop for tens of thousands of soldiers heading to far-off wars. Soldiers with names like Sutliffe Bither and Hiram Harlow, who wrote letters and kept diaries and whose words came home, even when they didn’t. $; 50 Moraga Ave.; . Crissy Field. Knockout views. Appealing mix of people. Good coffee. 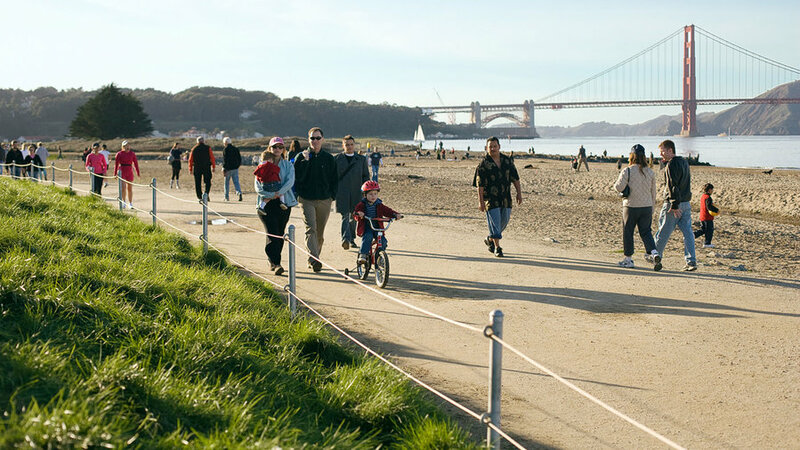 Crissy Field gives you everything you love about San Francisco in one package. A historic Army airfield transformed into a native plant-lined oasis, Crissy draws moms with strollers, kitesurfers, picnickers, dog walkers, cyclists, fishermen, and 8-year-olds letting the cool bay water lap their toes. All this and the Golden Gate Bridge looming gracefully, plus lattes, baked goods, and book browsing at the Warming Hut. Don’t miss: Let’s Be Frank’s superior grass-fed beef hot dogs from the cart just outside the Warming Hut on weekends. $; Entrance on Marina Blvd. west of Baker St.; . The SFJAZZ Center. After bumping along in rented halls for over three decades, SFJazz opened a luminous modern home of its own in the city. Up the street from the War Memorial Opera House and Davies Symphony Hall, it has a clubby performance space that accordions from 350 to 700 seats and will double the performances SFJazz can put on. $$; 201 Franklin St.; . San Francisco Cooking School. Scoring a weekend table at Locanda can be tough, but spending a Saturday learning how to hand-stuff cappellacci with the Italian restaurant’s chef is easier than you’d think. The San Francisco Cooking School, near City Hall, takes the city’s top chefs and cookbook authors and puts them in front of the class to teach hands-on lessons in butchery, candymaking, basic knife skills, and more. Classes are limited to 14 students, so one-on-one time in the sparkling new kitchen is guaranteed. $$$; 690 Van Ness Ave.; . Green Apple Books on the Park. After 48 years on Clement Street, indie retailer Green Apple Books has released its sequel. Green Apple Books on the Park opened in San Francisco’s Inner Sunset in 2014 with more space for readings, lit events, and an endless carousel of carefully selected titles. The new space still has the Green Apple vibe—a curated selection of new and used books and the familiar offbeat aesthetic—but it’s less crammed and creaky, with more of a bright showroom feeling, with local crafts on display. $; 1231 Ninth Ave.; . General Store. The neighborhood might be the center of what’s being called “NorCal Mod.” Find beachcombing-inspired wares on Judah Street at the General Store, home to vintage clothes, geodesic planters, and a collection of glossy coastal coffee-table books. Rest your legs on a tree-stump chair at the communal wood table in the backyard garden. $$$; 4035 Judah St.; . Heath Ceramics. The block-long converted factory that is now home to Heath Ceramics is so precious, it could double as a museum. Rev up at the on-site Blue Bottle Coffee, then move through a retail maze of earthenware, which includes a Heath-curated selection of housewares and gifts from other designers and makers, like the one-of-a-kind clock collection from House Industries. $$$; 2900 18th St.; . Eden & Eden. Much of what you see in Eden & Eden, a wonderfully eclectic Financial District boutique, is sourced by owner Rachel Eden from buzzworthy designers and traditional craftspeople in Eden’s native England. Check out the teapots with wool cozies hand-knit locally; a porcelain menagerie cast in Poland from the original midcentury molds; sweet knit dresses and scarves; and dramatic jewelry with lacy wings and voluminous Elizabethan ruffs among the motifs. $$; 560 Jackson St.; . Paxton Gate. This store has always felt like the Mission’s own natural science museum: wall-mounted taxidermy, spooky animal skulls, fossils. The store also holds terrarium classes. Sixty bucks gets you two hours with a plant pro plus all you’ll need to make your own botany bubble. Using forceps, students pluck tiny succulents from pots and carefully nestle them into 6-inch glass globes, which you can take home and hang over your kitchen window. $$$; 824 Valencia St.; .